NASA: El Niño driven ‘stagnant upper-air pattern spread numerous storms and heavy rains [into] central Texas’ no mention of ‘climate change’ | Watts Up With That? The climate zealots were out in force this week trying to link the rains in Texas to ‘climate change’. The press release from NASA makes no such connections, but instead blames a mundane weather pattern induced by El Niño. Video and explanatory graphic follows. This image shows IMERG rainfall estimates for the week-long period May 19 to 26, 2015 for the south central US. 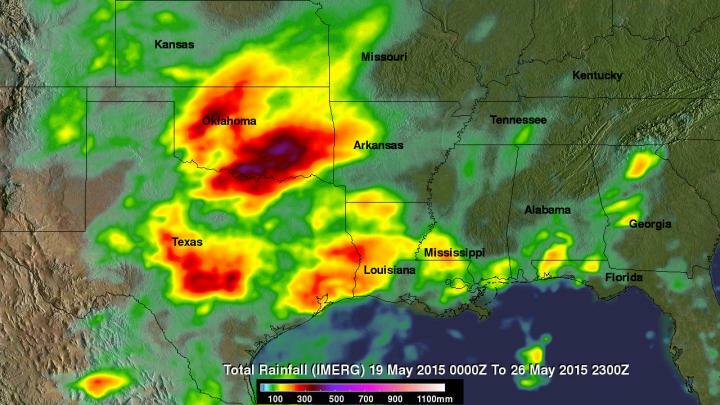 A stagnant upper-air pattern that spread numerous storms and heavy rains from central Texas up into Oklahoma has resulted in record flooding for parts of the Lone Star State. One of the hardest hit areas was in Hays County Texas south of Austin where the Blanco River rose rapidly and set a new record crest at over 40 feet, 13 feet above flood stage, following a night of very heavy rain in the area, with over 12 inches reported locally in a short period of time, in an area already wet from previous storms. The combination of high pressure over the southeastern United States and a persistent southerly flow of moisture up out of the Gulf of Mexico ahead of a deep upper-level trough that was slow to leave the central and southern Rockies set the stage for persistent widespread storms across the Southern Plains from the eastern half of Texas, through Oklahoma, and into southern Kansas. The Integrated Multi-satellitE Retrievals for GPM, known simply as IMERG, is a new rainfall product that produces estimates of precipitation from a combination of passive microwave sensors, including the GMI microwave sensor onboard the GPM satellite, and geostationary IR (infrared) data. This first image shows IMERG rainfall estimates for the week-long period 19 to 26 May 2015 for the south central US. IMERG shows upwards of 200 mm of rain (~8 inches, orange and red areas) across central and southeastern Texas and a large portion of Oklahoma with locally higher amounts exceeding 300 mm (~12 inches, shown in brown) in central Texas and 400 mm (~16 inches, purple areas) over south central Oklahoma, where early in the period a stationary front provided the focus for storms. So far at least 18 fatalities are being blamed on the recent flooding across the region. The recent rains drove monthly average rainfall totals well in access [sic] of the seasonal averages for this period. The panel on the right shows the current monthly TRMM-based average rainfall (which has a much longer climatology than IMERG) is well above the typical amount (shown in blue) for this time of year across most of the eastern two thirds of Texas and almost all of Oklahoma. The northern Gulf Coast also has above normal rainfall (shown in green) while at the same time the Tennessee and Ohio Valleys are showing below normal rainfall (yellow area). This type of pattern along with the excessive rainfall anomalies evident over the eastern equatorial Pacific offers a strong clue as to a potential culprit–El Nino. Anomalous rainfall over the eastern equatorial Pacific with alternating areas of above and below normal rainfall extending into midlatides is a classic El Nino teleconnection pattern. Rainfall anomalies were somewhat similar for this same time last year (left panel), but although there was an inkling, El Nino failed to materialize. This year El Nino appears to be alive and well. TRMM/GPM are a joint missions between NASA and the Japanese space agency JAXA. May 29, 2015 in El Nino Basics, Rainfall, Weather. but what happened to the epic drought? Wasn’t that caused by climate change? But my prediction is still that “weather not climate” will be conveniently forgotten by the media. “weather not climate” is used when needed by warmists, then put back in the closet when that truth is inconvenient. e.g. a cool year is ‘weather not climate’ a warm year is a ‘harbinger of warming climate’, etc. it last until the fall and winter. It is an out of season El Nino so far and normally one would expect the rainfall/temp impacts to occur later in the year but the convection storm and outgoing longwave retention patterns of this El Nino had already started to be quite large by as early as March. It has already started impacting weather. Facts don’t matter to the zealots. I think Mr. Obama could teach a course on Mr. Jones’, of Jonestown, methods. People like Mr. Obama don’t worry about the facts. They already have their believers enthusiastically and ignorantly believing anything they say. So who you gonna believe? NASA scientists or The Community Organizer in Chief? I had to rub my eyes to make sure I wasn’t seeing things. NO MENTION OF CLIMATE CHANGE??? Wow!! Whohooo! 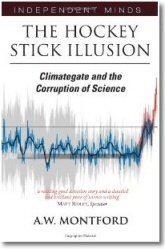 A breakthrough in the mainstream climate science cabal! NASA’s Goddard Space Flight Center (GSFC) has some sensible folk. NASA’s Goddard Institute for Space Studies (GISS) at Columbia Univ. is where Gavin manage his merry tribe. Well, they aren’t so merry since the missing heat suggests CO2 isn’t the demon gas it never was. Republicans control the congress again. They’ll have to control their urges if they want funding. They want to keep their climate funding duplication thing going and zealotry was not working for them. The alarmists don’t need NASA. Just pay some university to claim it’s climate change. Bill Nye the propaganda guy was on TV scaring the masses and linking this event to climate change (without a shred if evidence). He said we should have a conversation but in the same breath called skeptics deniers and equated them with tobacco company’s rejection of smoking as a cause of cancer. He appeared without a counter point of course. Interesting. But didn’t Weatherbell.com predict the Texas scenario months ago based on the temperature of the Gulf of Mexico and historical analogs? Have no fear; the Climate Liars will figure a way to work it in. Paris awaits. That’s all right. It’s been well established that Climate Change causes ‘mundane’ weather. That’s an obvious result of ‘climate weirding’. Give the EPA some more money! Well, ya know, it HAS to be climate change, cuz there has never ever ever been a flood on a Texas river before last week!!! On a more serious note: A lot of us in Texas have noticed that the weather over the last 8 years or so has very much resembled the weather of the 1950’s, the decade of the last truly epic drought here. (and that one was worse than this one, lasting 7 long years) Interestingly, the drought of the 50’s didn’t end quietly; it also ended with a statewide wave of massive flooding. Another interesting note, not proved, but which seems to jump out of the historical numbers, is the suggestion that there appears to be a 60 year cycle to these things. Before the 1950’s, the worst multi-year drought had been in the 1890’s. That drought helped drive almost all of the great cattle ranchers into bankruptcy, and generally is credited as the weather event that finally drove the last nail into the coffin of the Old West. 60 years before that this was still Comanche Country, and nobody was keeping records. So, the epic multi-year Texas droughts have happened in the 1890’s, the 1950’s, and the 2010’s. And they all ended with a statewide wave of flooding. That’s a pretty fascinating series of dates, and at least to me, suggests some kind of link with the PDO. I’d love to see an honest climatologist do some research into that. “I’d love to see an honest climatologist ” too. Do you know where one might be found? Most of them are in a gulag somewhere I assume. They can’t all have been corrupted, can they? I think retired Prof. Richard Lindzen is an honest climatologist. Dr. Christy, too. Dr. Spencer. And there are some others. But you’re right, money corrupts. They say money talks. I say money screams. Many people cannot resist the money. They want their next pay raise, and their next promotion. Maybe most can’t resist the easy money in the modern world. But some of them are still honest, and ethical. They should be applauded, because it takes courage to speak one’s mind when everyone else is clucking about “carbon”. All of those time periods which you mention have one thing in common. They all occur within 4 to 6 years after the shift to a cooling trend. The first cool trend shift was around 1885/86, and was followed in the 1890s with drought and then flood. The next similar combination is at the cool trend shift around 1946/47, also followed by drought and then flood. Then finally the most recent with the cool trend shift around 2006/07 once again leading to drought, and now comes the flood part of this system. Note that if we could look back to see what happened after the cool trend shift 1825/27, that it would be probable to find drought conditions in the 1830s which would eventually be followed by floods. The old Spanish records from that time period would be a good place to obtain some data from the period. The California missions should also have good detailed records of unusual weather events from that period. Droughts often seem to end with floods. I think that as a stable weather pattern begins to break down it passes through a period of a semi-stable but different pattern before it settles back into normally unstable weather if that’s what normal is. OTOH, a stuck pattern unstuck by El Nino for its duration certainly fits the bill too. You are right on . Each of the periods that you mentioned subsequently experienced 2-3 decades of cooler weather as well and this has also started again this time in North America . These are all natural cycles whose history and cause have very little to do with global warming . 60 year cycle … hmmm … where have I seen that? I have no idea if Scafetta’s hypothesis is correct, although it’s very interesting. There could be other reasons, yet undiscovered, for the 60 year cycle. One thing that seems indisputable, though, is that for whatever reason, that’s the number that keeps jumping out of the data at us. Ever hear the phrase ” too poor to leave Texas” there was an epic drought sometime in the 1830’s into the 40’s. Those that could afford to leave, did so. They moved back east. (before Texas became independent). CAGW likes to pretend they have no idea what the weather was like. That clear headed emptiness that takes hold when data interferes with their mantra. I don’t know what lessons can be drawn here, but record floods and river crests are fairly significant events that should be taken seriously, even though there appears to be a good meteorological explanation for what caused the storms and heavy rains, we do have reasonable evidence that we do not know nature’s full potential, even during the existing climate regime. One lesson would be, as we’ve already seen in the case of Sandy at NYC, that major coastal cities in the USA may not be adequately protected against high water. While all the hysteria is about relatively small sea-level changes of an inch or two, storm surges, floods, and other high water events of perhaps tens of feet are given scant attention by our irresponsible media, and public officials. Yes, so government needs to stop subsidizing development in these areas and let the market do it’s thing, which would be to discourage said development or at least build in the actual costs of doing so. But, alas. that would be a bloody miracle in this day and age. Older males in England will recall their barber on a Friday evenings asking cryptically “Something for the weekend sir?”. Bob’s post on McCarthy et al followed by this NASA blurb, both totaly devoid of CAGW references, sends me into the weekend with high expectations that sense my be starting to prevail and at my age that’s far more enjoyable than anything that the barber had in mind. Had this been December/January, the storm track would have been much more favorable to bomb Southern California with El Nino driven energy/moisture……….and it would have come like it usually does in that region……………too much and too fast. By the time we get well into the Spring season because of the seasonal shift, even a strong El Nino is no longer able to generate rains in Southern California. It is capable, however of doing what we witnessed over the past month in the Southern Plains. Look at these rainfall totals in parts of Oklahoma/Texas into far W.Arkansas….over 20 inches in some spots! If we get lucky and this El Nino is roaring in 6-9 months, California and the Southwest will benefit from too much rain as they often do when it does come and we can read about how climate change is responsible. There is a strong correlation between El Nino’s and above average rain in the Southern US. 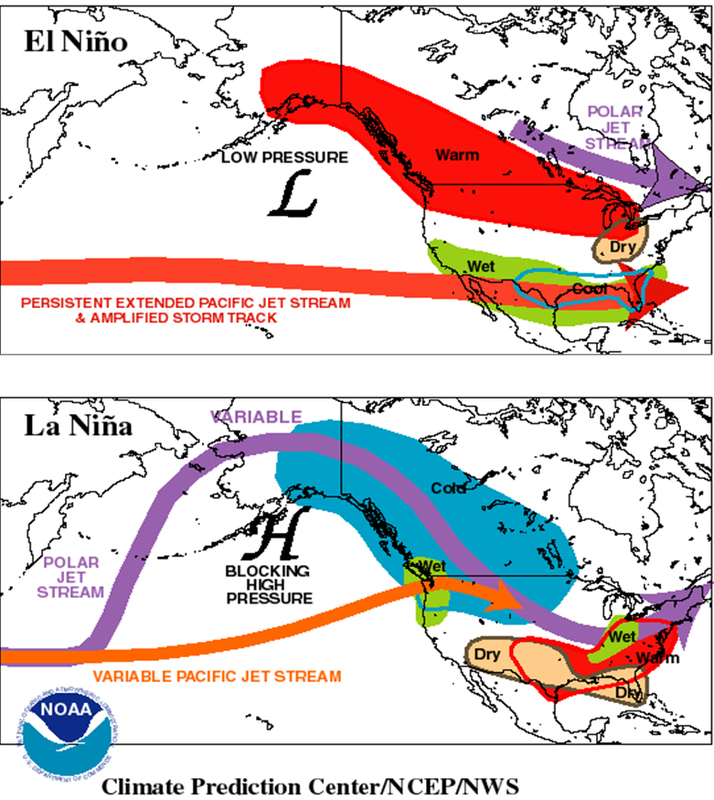 La Nina’s increase the chance for droughts. We have the opposite ENSO signal that we had during the drought and are seeing the opposite kind of weather as a result. These rains really are extreme and more like those, for this area at least that would occur from a tropical system but they have happened before. This is nothing more than patten recognition based on the temperature profile(s) of the Pacific Ocean and resulting, prevailing/dominant weather patterns that historically occur downstream. If you have a extensive pocket of warm(cold) water in a key oceanic location(s), it has profound effects on the atmosphere in the immediate many hundreds of miles of the atmosphere but it isn’t even close to being limited to that range, going many thousands of miles away as in this case. .
One can make a case(and I agree) that since the atmosphere is ~1 degree warmer than it was a century ago that individual high end heavy rain events have a potential to drop more rain. However, the increase in global temperatures at the higher latitudes decreases the meridional temperature gradient that provides energy for many mid latitude weather systems. So the air is capable of holding more moisture but overall, the atmosphere should be less violent as less heat is needed to be transported towards the poles in an attempt to balance/equalize. This is one of the very few cases(and they only relate to heavy rain events) where I think that a warmer planet is a legit factor in amplifying the event. If you don’t believe that, then believe the correlation between El Nino’s and heavy rain events, then make the correlation between increased El Nino’s in the 1980’s/90’s and irrefutable global warming during the same time frame. Perhaps with the Senate cutting funding to science and perhaps even more over the next few years, could this have opened the eyes of NASA, finally realizing that they had better clean up their act or they too may be severely defunded in years to come. It’s funny how money can influence what you say and do, or don’t do. Let’s keep a record of reports that have not confused global climate with regional weather. The NASA article is #1. What is the El Niño/La Niña (weather) phenomenon averaged over 30 years to a couple of centuries, and what are its effects over the globe? Of course there is no mention of Climate Change. Oklahoma lakes filled to the hilt in a single month does not fit dire drought that climate change has been predicting for my region. BTW we are done with the rain now the gods can shove some over to CA. Sure has been raining quite a bit in North Alabama since late November. We are almost 2 inches above our average rain fall. Typically, North Alabama gets around 56 inches of rain a year. Might top 60 this year. Shouldn’t the issue be what the rainfall rates are now and were in the past? Over here in South Carolina, we progressively have worse flooding in populated areas because of the ground cover with increases in population and commercial development. The headlines here and in Texas focus on record stream levels, destruction, deaths, property loss, etc. which consistently increase due to growing populations, more and higher valuation of real estate, and inflation in general. I haven’t researched the statistics, but I gather from the comments above that this drought/flooding is nothing but normal fluctuations of weather. If we start hearing of heat snaps and cold waves, we will know there has been at least some climate change. I don’t know which way to pray. I guess it’s a Goldilocks situation. Please let our El Niños be predicable and mild…Please keep our world in this wonderful p/m 1.5 degree range. Please keep the seas from rising or falling, and may the glaciers be constant forever and ever. Not all ENSO events are equal and each one depending on the other items exerting a force upon the climate at the time of the ESNO event along with the strength of the ENSO event ,time of THE season of the event is going to give an x climate outcome. This particular climate outcome within bounds of normal climatic variability. I might have thought that at least some commenters in the MSM might have mentioned the good news that the drought in West Texas is considerably diminished by now. Gee, I wonder how well NOAA predicted a record wet May for Texas and Oklahoma? I’d call it a miss. Here is a link to a photo of a comparison NOAA 60-day Precipitation Percent of Normal map for the US captured on May 29, 2015. Clearly they underestimated the effects of climate change and its unpredictable effect on extreme weather events, lol. Last year, weren’t the warmest predicting a state of permanent drought in Texas because of climate change? 30 day Av.SOI = Average daily SOI value for the previous 30 days. 90 day Av.SOI = Average daily SOI value for the previous 90 days. 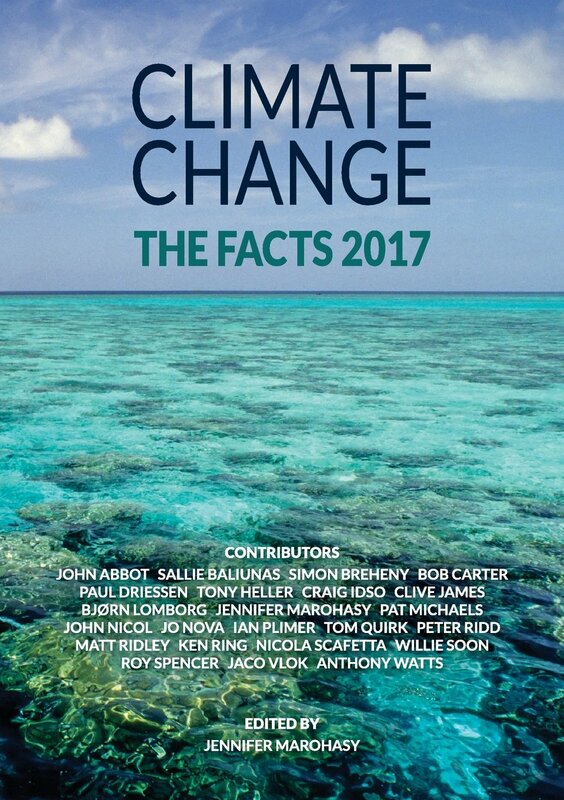 I’ve noticed that over the past 12 months or so there is very little reference to ‘climate change’ in weather reports in the Australian press. It used to be that the last paragraph on most reports of floods/droughts/storms/etc had the obligatory reference to CAGW or ‘as predicted by climate models’ or the like. Has the press finally taken notice of the ‘pause’? Probably because of all the inconvenient milder, cooler and wetter weather we’ve been having in Oz recently. Best just keep quiet about it. I think there is still a small part of the desert/farmland in West South Queendland that are still in “the worst drought evah”, but even that is a shrinking zone. El Niño is the same as a year ago. But AMO down sharply. In the context of intermittent weak El Niño conditions over the last year, this section features a comparison figure with similar weak events, excluding prolonged “Year-2” El Niño conditions. It appears that the situation will become more clear-cut by mid-2015, so that a larger sample of comparable events can be chosen. It must have been implied in that case. The current position of the jetstream looks like the La Nina pattern given above (look at Accuweather). The Texas/ Oklahoma big rain event is more likely just weather, and people are jumping the gun on El Nino. In spite of predictions of a super El Nino last year the “Spring Prediction break ” fooled most predictors. You are losing your credibility citing wikipedia for that. ??? Hundreds of Nuke weapons were tested in Nevada, a couple over a few Pacific islands, a few off of the CA coast (ASW weapons, for example). One or two up north. Texas? They only built (assembled) the cores there. Isn’t Nevada a city of the state called Texas ? Thanks Mod , Is this info not correct? And when did Nevada become a state ? Cheers Mod Found the state of Nevada where the nuclear tests were, They were not carried out in the state of Texas as I may of misled some to believe. But here are a few things that should concern all Texans http://www.agriculturedefensecoalition.org/content/texas-issues-weather-modification . The first atomic bomb test in the United “States was in New Mexico. Naaa. This isn’t caused by CO2 or natural intrinsic variations brought about by El Nino conditions. This is solar doncha know. The updated (March-April) MEI has risen by 0.30 standard deviations to +0.95, for a strongly increased ranking, now crossing over the ‘strong’ El Niño threshold (upper 10%). Something similar happened last year when the MEI peaked in April-May 2014 with +0.93, only to drop back in subsequent months. If you live on a flood plain, ask yourself: how was this flood plain formed? It may not flood every year but sooner or later it will flood a lot. So expect a healthy jump in insurance premiums or no insurance at all.